New Mexico officials say they plan to sue the federal government and the owners of two Colorado mines that were the source of a massive spill that contaminated rivers in three Western states. The New Mexico Environment Department says it filed a notice Thursday of its intention to sue the U.S. Environmental Protection Agency over last year's spill. The lawsuit would be a first and would also target the state of Colorado and the owners of the Gold King and Sunnyside Mines. An EPA cleanup crew accidentally unleashed millions of gallons of contaminated wastewater in August at the inactive Gold King mine near Silverton, Colorado. 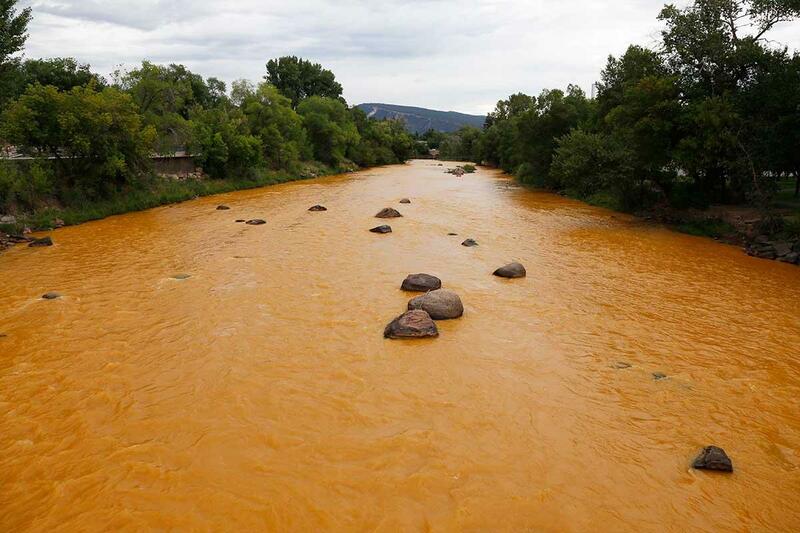 It fouled rivers in Colorado, Utah and New Mexico with contaminants including arsenic and lead. A spokeswoman for the EPA didn't immediately return an email from The Associated Press. The U.S. Environmental Protection Agency says it's reviewing New Mexico's plan to sue the federal government over a massive spill last year that contaminated rivers in three Western states. The agency declined to comment on New Mexico's notice to sue but said federal officials are working closely with the states to develop a long-term monitoring plan to evaluate potential environmental effects. The lawsuit would be a first and also would target the state of Colorado and the owners of the Gold King and Sunnyside Mines. House Rep. Jim Dines is proposing a measure that would give New Mexico voters the option during the next election to create an independent ethics commission. He says the goal would be to crack down on unscrupulous public officials and employees of the legislative and executive branches of government. New Mexico is one of just several states without an ethics commission. Calls for creating such a panel were reignited last year after former Secretary of State Dianna Duran was prosecuted for misusing campaign donations to fuel her gambling addiction. Dines' proposal calls for amending the New Mexico Constitution, which would require the approval of voters. Some House Democrats are pushing for legislation to create the panel. But under Dines' proposal, he says the panel's hearings and findings would be public. Defense attorneys for an 18-year-old who pleaded guilty to killing five family members have called a neuroradiologist as their first witness in a hearing to determine whether the teen can be rehabilitated through psychiatric treatment. After more than two days of testimony from medical experts, sheriff's deputies and other witnesses called to the stand by prosecutors, Nehemiah Griego's public defenders began building their case Wednesday. The defense says Griego was abused by his father and likely suffered traumatic brain injury. A judge is expected to determine in February whether Griego should be sentenced as a juvenile or an adult. Griego was 15 when authorities say he opened fire inside his family's home south of Albuquerque, killing his parents and three younger siblings. Immigrant advocacy groups say they are monitoring New Mexico for possible raids by federal immigration authorities. Advocates say they've received no reports of raids in New Mexico targeting immigrants suspected of being in the illegally but are preparing families on how to handle them. Isaac De Luna from the Albuquerque-based Center for Equality and Rights says advocates are holding workshops with immigrants to educate them on their rights. Robert Heyman, of the El Paso, Texas-based Border Network for Human Rights, also says his group is helping immigrants in southern New Mexico prepare for possible raids and keeping taps of developments around Las Cruces. Immigration agents conducted the first raids early this month targeting the deportation of families who flocked across the United States' southern border over the past two years. The New Mexico Department of Health has created a system for tracking influenza across the state to detect changes in the disease as they occur. The influenza surveillance system involves partners across New Mexico in clinics, hospitals, laboratories, at the federal Centers for Disease Control and Prevention and within the state health department. The department maintains a network of 27 sites statewide that collect data on a weekly basis for patients seeking care for influenza-like illness. The state participates in a system for monitoring residents hospitalized with influenza in 23 hospitals in New Mexico and Texas. Data is collected to track the number of people who have died from influenza and related infections and to understand what other risk factors contributed to their death. Oil prices dropped to $30 a barrel on Tuesday, prompting lawmakers to revise budget plans ahead of the legislative session starting later this month. KOB-TV reports that oil and natural gas revenues make up nearly one third of the state budget and the current budget drafts are based on oil at $45 a barrel. Projections for new money this year were around $232 million. Sen. John Arthur Smith told KOB that the new oil prices would be “devastating” to the state budget. Wildlife advocates are planning news conferences and rallies Thursday in Utah, Colorado, New Mexico and Arizona to call out state leaders for trying to keep their lands out of a potential recovery zone for the Mexican gray wolf. Kirk Robinson of Western Wildlife Conservancy says government leaders in the four Western states are spreading inaccuracies. Utah's wildlife board recently sent a letter to the Department of the Interior arguing scientific research shows wolves have never lived north of Interstate 40, which runs through New Mexico and Arizona. The board said trying to lure the wolves to Utah would harm the species because they would hybridize with Northern gray wolves. Governors from the four states sent a similar letter in November. The Mexican wolf, a smaller subspecies of the gray wolf, is an endangered species. New Mexico Attorney General Hector Balderas says the legal battle with Texas over management of the Rio Grande is moving ahead and this is no time for the Legislature to cut funding. Balderas testified Wednesday before the House Appropriations and Finance Committee, one of the key panels that will be crafting the state budget when the legislative session begins next week. Legislative finance analysts are recommending $500,000 for Balderas' office to use for the ongoing litigation. Past funding has topped $2 million and Balderas had requested $3 million for the next fiscal year. He says the funding is critical since the case is ratcheting up. He argued New Mexico's economy and rural communities could be affected. Texas sued New Mexico in 2013, claiming the state failed to deliver water as required under the Rio Grande Compact. New Mexico lawmakers will consider a first-time tax on e-cigarettes along with increased levies on cigarettes and chewing tobacco. The proposal for a 66 percent tax on e-cigarettes was introduced on Wednesday by Democratic state Senator Howie Morales of Silver City. Taxes on conventional cigarettes would increase by $1 to $2.66 and taxes on other tobacco products would rise from 25 percent to 66 percent of initial sales. Several states are examining tax structures that account for the growing popularity of e-cigarettes and other alternative tobacco products. Electronic cigarettes use a small battery and a tobacco-based nicotine liquid to produce a mist or vapor with no tar. The proposed legislation is endorsed by the American Cancer Society, American Lung Association, American Heart Association and other public health groups. An Albuquerque police officer who was involved in a wrongful death lawsuit that cost the city millions is suing for a promotion. Court documents show Brett Lampiris-Tremba is suing Albuquerque police and the city, claiming he has passed all necessary tests and certifications to become a sergeant. He says the police department is violating its own rules by not promoting him. Lampiris-Tremba is also asking for more than a year of back pay. Albuquerque paid out roughly $8 million in a 2013 wrongful death lawsuit after Lampiris-Tremba shot Kenneth Ellis III in the neck while Ellis III held a gun to his own head. Ellis III's father, Kenneth Ellis, Jr., called the idea of Lampiris-Tremba being promoted "ludicrous." Lampiris-Tremba's attorney didn't return a message from KRQE-TV. Police are investigating a student's claims that a Santa Fe Public Schools fifth-grade teacher placed duct tape over the mouths of five students. Santa Fe Police says the student made the claim about the incident, which allegedly happened in December, Monday at a parent-teacher conference at Cesar Chavez Community School. The district has placed the teacher on paid administrative leave while police investigate. Principal Tammy Hall in a letter to parents said officials have started an internal investigation and that it is a confidential personnel matter. The New Mexico Game Commission has denied an appeal by the Turner Ladder Ranch for a permit to host Mexican wolves as part of a federal species recovery program. Thursday's unanimous decision caps a nearly eight-month saga in which the southwest New Mexico ranch owned by media mogul Ted Turner tried to convince the commission to reconsider its original denial in May. The permit had been in place 17 years. The Albuquerque Journal reports commission members invited the Turner Endangered Species Fund to reapply for a permit. The ranch near the Gila National Forest provided pen space for wolves being released into, or temporarily removed from, the wild by the federal government since the program to reintroduce the endangered Mexican wolf began in 1998. Fort Bliss in El Paso, Texas, has announced it will no longer accept a New Mexico driver's license as a form of identification from visitors. The El Paso Times reports the U.S. Army Base announced the change Wednesday and said it would stop accepting New Mexico IDs because they aren't in compliance with the federal REAL ID Act. The base also said it would not accept IDs from other noncompliant states: Illinois, Missouri, Minnesota and Washington state. White Sands Missile Range and Sandia Labs also said this week they would stop accepting New Mexico IDs. The moves comes after the U.S. Department of Homeland Security declined to give New Mexico an extension on complying with tougher rules that require proof of legal U.S. residency in order for state driver's licenses and IDs to be valid for some federal purposes. The state has traded the old Dixon Apple Orchard and 8,800 acres of state trust land in northern New Mexico to Cochiti Pueblo in exchange for the site of a downtown Santa Fe hotel. The three-party deal announced today gives the Garrett's Desert Inn site in downtown Santa Fe, which also includes the renowned Santa Fe Bite restaurant, to the State Land Office. The property is across the street from the Land Office's headquarters. The Catron family is selling the Garrett's site to Cochiti. The property being traded to the pueblo has sacred and ancestral village sites and hunting areas that Cochiti has been seeking for years. It is unclear what the Garrett's property will be used for in the future. New Mexico lawmakers are confronting heightened concerns about violent crime, a weak economy and lackluster schools as they convene for a 30-day budgetary legislative session. The session begins Tuesday against a potentially acrimonious political backdrop, with the Republican-controlled House and Democratic Senate both up for election in November. Republican Gov. Susana Martinez has wide discretion over what bills are heard and has indicated a focus on law enforcement initiatives in response to a string of high-profile violent crimes over the last year. Those include the shooting deaths of two police officers and a 4-year-old girl who was killed during a road-rage incident in Albuquerque. The governor and lawmakers largely agree on budget priorities that emphasize growth in Medicaid spending, increased costs of incarceration, teacher pay and economic development initiatives. Federal officials have denied New Mexico's appeal to keep federal status and funding for its elite search and rescue team. The Santa Fe New Mexican reports that the Federal Emergency Management Agency ruled last week that the New Mexico Task Force 1 team will no longer be one of the 28 elite urban search and rescue teams in the country. It was designed to respond to any type of disaster in the U.S. within hours. FEMA removed the team's federal status in September, citing the team's ongoing struggles with finances and training. The task force will no longer receive millions of dollars for specialized training and equipment that have contributed to the state's disaster response. One of New Mexico's largest utilities is dedicating a new multi-million-dollar natural gas power plant capable of generating enough electricity for 25,000 average homes. Official with Public Service Co. of New Mexico, business leaders and community members are gathering Thursday afternoon near Belen to dedicate the 40-megawatt La Luz Energy Center. State regulators gave the project the green light in June 2014. It's located near existing transmission lines and two major natural gas pipelines, which utility officials say will help keep operational costs down. Officials say the plant will also provide an estimated $562,000 a year in tax revenue for Valencia County.